India is rapidly moving towards becoming a digital economy with the digital transformation poised to add close to USD 154 billion to the country’s GDP. Among the various technological advancements contributingto this transformation is Cloud Computing which offers organizations a great degree of scalability, flexibility and lowered operational costs; while meeting their unique business requirements. According to Gartner estimates, Cloud services are expected to grow exponentially in the coming years with Infrastructure as-a-Service (IaaS) poised to become the fastest-growing segment of the public cloud market. However, even with these advancements, moving to the Cloud isn't always easy and involves challenges of migration, integration, security, lack of adequate infrastructure and vendor lock-ins; which hinder organizations from succeeding in their Cloud adoption journey. Acknowledging these challenges, Hangzhou headquartered Alibaba Cloud steps forward to address them with a complete portfolio of reliable and secure Cloud services, to support business growth. Application Services and Big Data Analytics. Alibaba Cloud also offers enterprise cloud security products as well as complete Hybrid Solutions to integrate Enterprise On-Premise workloads with the Alibaba Cloud. “Alibaba Cloud has always been focused on empowering enterprises of different sizes to tap into opportunities in the digital age,” affirms Alex Li, General Manager–Alibaba Cloud, India. “Our strong expertise in the e-commerce, logistics and fintech segments have helped us develop cloud solutions which can add value to our current as well as prospective customers,” he adds. The deployment of a highly available and scalable web applications on a traditional data center today is a complex and expensive process which requires businesses to invest extensively into capacity management. Understanding this challenge, Alibaba Cloud brings its Elastic Compute Service, which provides fast memory and the latest Intel CPUs to help customers power their cloud applications and achieve faster results with low latency. Moreover, with virtual network requirements increasing everyday, the company has developed a Virtual Private Cloud (VPC), a private network dedicated to customers in Alibaba Cloud. 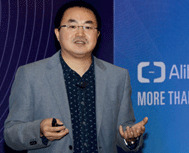 With this feature, customers can create a dedicated connection between the VPC and a local data center to expand their local network and seamlessly migrate local applications to the Cloud.In addition to these capabilities, Alibaba Cloud also highly prioritizes the privacy needs of its customers and ensures international security standards as well as strict compliance with all applicable laws in every market that it operates in. Having delivered an expansive portfolio of Cloud solutions within India, Alibaba Cloud has gained significant momentum in the country over the last few years. The company which recently signed an MoU with Andhra Pradesh Economic Development Board (APEDB) and envisages leveraging its cloud and smart city technologies for sustainable farming and smart city management in the city. Moving forward, Alibaba has also partnered with the ONGO framework and intends to bring more digital transformation services to SMEs in India in the upcoming year.